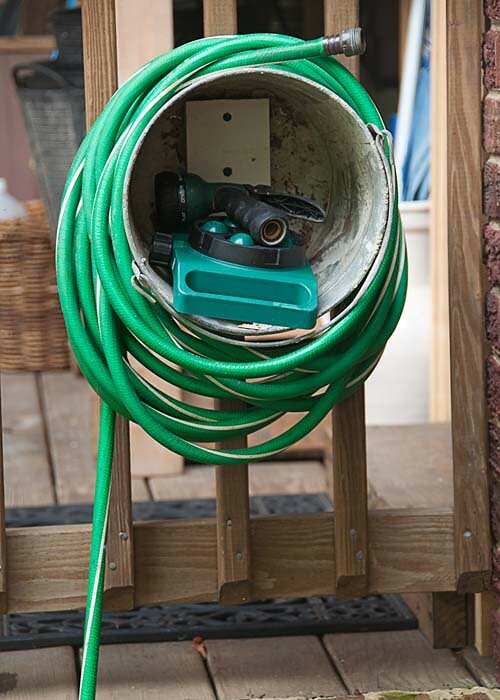 Kudos to local resident Terry Rowe for her ingenuity in turning a metal pail found in the trash into a spool for holding her garden hose and nozzles. Terry needed something to corral her garden hose. On trash day, she happened upon an old metal pail someone no longer needed and thought she could use it like a spool to hold the hose. Her husband drilled holes in the bottom and used a piece of scrap wood as a brace to attach the pail to their side porch railing. As you can see from the pictures, it works nicely to hold the hose. An added bonus, they can store the nozzles and a small sprinkler inside the pail. They decided against painting the pail because they liked its patina. The cost was nothing as the pail came from the trash and they used scrap wood and a couple of screws. Thanks Terry for submitting your project! If you have a project you’d like to share, send to diydelray[at]yahoo.com. Great idea! 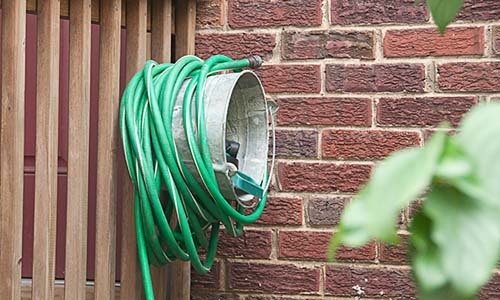 We were just discussing whether we’d buy a new hose reel or find one on Craigslist, but I love seeing how others have reused and repurposed items to fit the need.